Lt. Col. Paul Muller challenged his Memorial Day audience to do what they can to honor those who have sacrificed their lives for American freedom. Boy Scout Pack 8 marched in the parade Monday morning. The Wauseon High School Choral group performed. 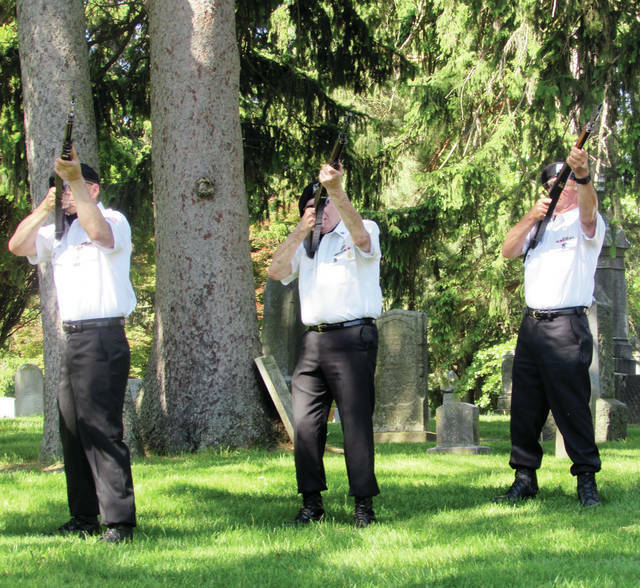 Members of the VFW/American Legion/DAV Rifle Squad fired a three-volley salute at the Memorial Day ceremony. Lt. Col. Paul Muller told his audience the sad truth: the true meaning of Memorial Day has faded over time. His comments followed a full program that began with a parade that extended from the city building on Clinton Street to the cemetery. Participants included the city police and fire departments, the high school marching band, and local Boy Scout Pack 8. After the posting of colors by the American Legion, Disabled American Veterans and VFW Color Guard, those in attendance sang the “Star Spangled Banner” and recited the Pledge of Allegiance. 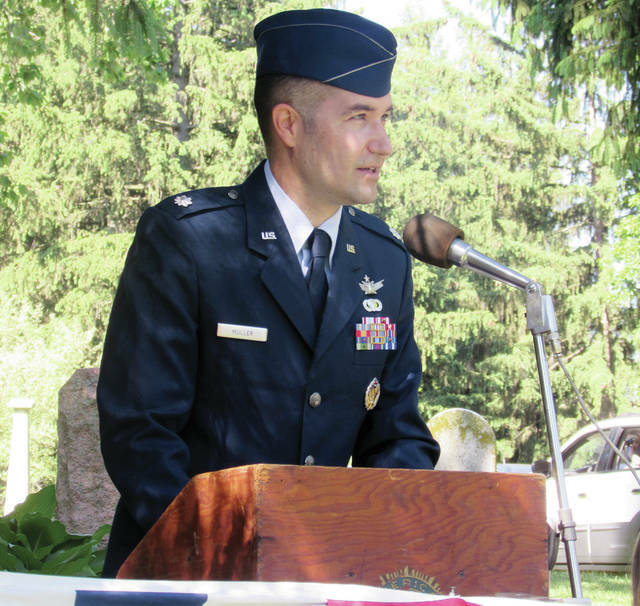 Mark Mahlman, past commander of American Legion Post #265, introduced nine military veterans who chose to be recognized, including representatives of World War II, the Korean War, and the Vietnam War. Ceremony host Judge James Barber rang a bell during a “Last Call” segment that named 19 members of the American Legion who have died this year. They include Edward Altman, Doyle Bernath, James Blosser, Charles Bryan, Frank Donnett, James Gype, Thomas Huffman, Delores Mandel, Larry O’Brien, Herbert Rising, Juan Rodriguez, James Sattler, Richard Shinners, Robert Smith, Kenneth Stephens, James Studenka, William Tanner, Howard Torrence, and Gaylord Wagner. The WHS choral group performed, and the marching band played a medley of armed forces themes to permit veterans to stand and be recognized. He also awarded several Wauseon students who won honors in an Americanism essay contest. Muller, a graduate of the Reserve Officer Training Corp program of the Worcester Polytechnic Institute, had also been deployed to Afghanistan to lead a joint U.S./Afghan team. The team chose Afghan soldiers and pilots for training in the U.S. in an effort to secure Afghanistan’s borders against terrorism and to stabilize the government. Unfortunately, Muller said, once some of those soldiers entered the U.S. they chose to run rather than train to fight. He said their actions left an impression on him. He said TV commentators and reporters would have U.S. citizens believe the country is in the midst of a serious political and moral divide. https://www.fcnews.org/wp-content/uploads/sites/45/2018/06/web1_memorial-day-6-1.jpgLt. Col. Paul Muller challenged his Memorial Day audience to do what they can to honor those who have sacrificed their lives for American freedom. 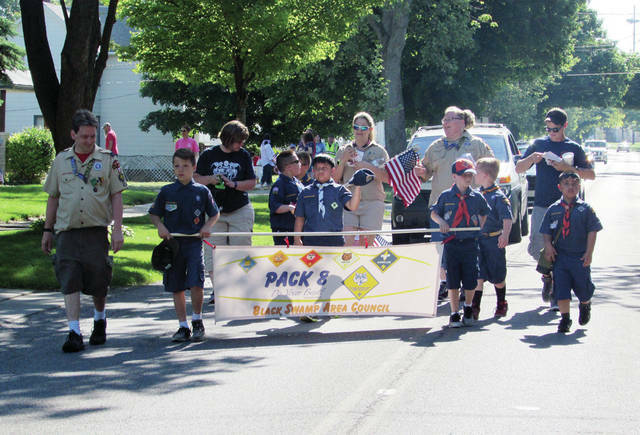 https://www.fcnews.org/wp-content/uploads/sites/45/2018/06/web1_memorial-day-3-1.jpgBoy Scout Pack 8 marched in the parade Monday morning. 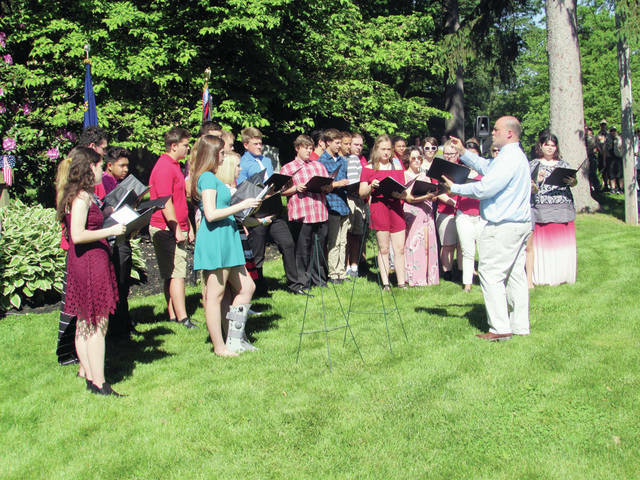 https://www.fcnews.org/wp-content/uploads/sites/45/2018/06/web1_memorial-day-5-1.jpgThe Wauseon High School Choral group performed. https://www.fcnews.org/wp-content/uploads/sites/45/2018/06/web1_memorial-day-8-1.jpgMembers of the VFW/American Legion/DAV Rifle Squad fired a three-volley salute at the Memorial Day ceremony.